When you move to Santa Fe you might wonder what some of the things are that you can do to relax. Well just 15 minutes from campus you will find El Rancho de Las Golondrinas a living history museum. The museum is open to the public from the Spring Festival in June through their last Festival – Spirits of New Mexico’s Past the last Saturday in October. The Ranch have costumed volunteers that introduce you to Spanish Colonial life from the 1700’s on. There are 200 acres open to the public with buildings that range from the reconstructed Golondrinas Placita that shows the life of the Spanish colonists in the 1700’s to a one room school house that was transported from Northern New Mexico. Depending on the day you go you can eat bread freshly baked in an horno, watch people spin wool from the ranch’s flock of heritage Churro sheep into yarn, and weave on a loom almost 200 years old. Or there might be blacksmiths forging away, and millers grinding grain in one of the mills. Every month there are one or two festival weekends. In July there is a wine festival and a festival celebrating Mexican cultures. August has a festival celebrating foods from the area and in September is the not really historically correct Renaissance Fair with fairies, jousting, the royal court, and visiting dragons. During all the festivals there are costumed volunteers to answer your questions and demonstrate how peopled lived. 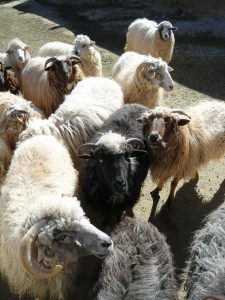 I’ve enjoyed volunteering there for years learning all aspects of taking the wool from the sheep – spinning it into yarn, naturally dyeing the yarn, dressing the looms, and weaving the blankets and rugs that are part of the exhibit. I especially like playing in the dye shed. Come play, learn, and recharge yourself.